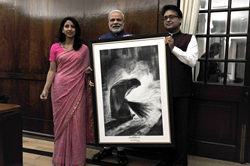 Belgian raised Indian artist, Shreya Mehta was recently invited to the Indian Parliament house to present Honorable Prime Minister of India, Narendra Modi with her artwork, ‘The Sweeper’. Belgian raised Indian artist, Shreya Mehta was recently invited to the Indian Parliament house to present Honorable Prime Minister of India, Narendra Modi with her artwork, ‘The Sweeper’. It all began when Shreya wrote a letter to Narendra Modi’s office highlighting why she would like to present the painting to him. She immediately received a call from his office and soon after travelled to Delhi with her husband Amish to meet Mr. Modi. The meeting was inspirational not just for Shreya but Mr. Modi also got inspired by her and the artwork and wrote a poem for her in return. 100% of net proceeds from the sale of her artworks go to charity. Shreya believes there is a direct connection between art, human emotions, and helping people. She teams up with charitable organizations that she is personally touched by and those who have a proven track record. One of her earliest artworks, “The Blessed One”, was of a pregnant woman basking in the sun. A childless patron bought the piece and the money raised went to support Trisha, a 5-year-old girl in SPRJK trust in Mumbai. All of her basic requirements are met so she can focus on her dream of becoming a doctor. One Artwork = One Step = One Trisha = One World made better for all of us. Currently, Shreya stays in Scarsdale, New York. She recently held a solo art exhibition at the Indian Consulate of New York where she represented Gujarat for their State by State Initiative. Please visit her website http://www.shreyamehta.com or her Facebook to find out more about her works and the charities she helps.